Could Knee Pain Be First Sign of Lung Cancer? Knee pain can sometimes be the first symptom of lung cancer, though other causes are certainly much more common. It's important to be aware of this and other uncommon symptoms of lung cancer for a few reasons. At the current time we don't have a screening test for lung cancer for everyone, and often need to rely on symptoms to find the disease as soon as possible. Lung cancer is most treatable in the early stages of the disease, but far too often is diagnosed in the alter stages when surgery can no longer be curable, especially in people who have never smoked and do not think they are at risk. It's important to note than anyone who has lungs can get lung cancer, and lung cancer in never smokers is the sixth leading cause of death in the U.S.
One study suggests that “monoarthritis,” that is, arthritis confined to only one knee, may be an early sign of lung cancer in some people. This study looked at over 6000 individuals that were seen in a rheumatology clinic (a clinic for people with arthritis). In 1.7 percent of these patients, arthritis confined to one knee was the first sign of non-small cell lung cancer. All of these patients were diagnosed at an early stage when their tumor could be treated with surgery. It should be noted that all of these individuals had been heavy smokers, and quitting smoking remains the single most important goal for avoiding lung cancer. But it wouldn't be surprising if this changes as well, as we are seeing a true increase in the risk of lung cancer in never smokers. It's not only lung cancer, however, and a 2014 study found that knee pain and swelling might be a sign of colon cancer as well. Though these researchers did not leave us with any practical tips for early detection based on this study, it does raise several important points. If you smoke, or smoked in the past, see if you meet the criteria for lung cancer screening (discussed below). If you are not a candidate for lung cancer screening, this information is still very important. As noted above, most people are unfamiliar with the current signs and symptoms of lung cancer, and the most frequent signs and symptoms are changing. 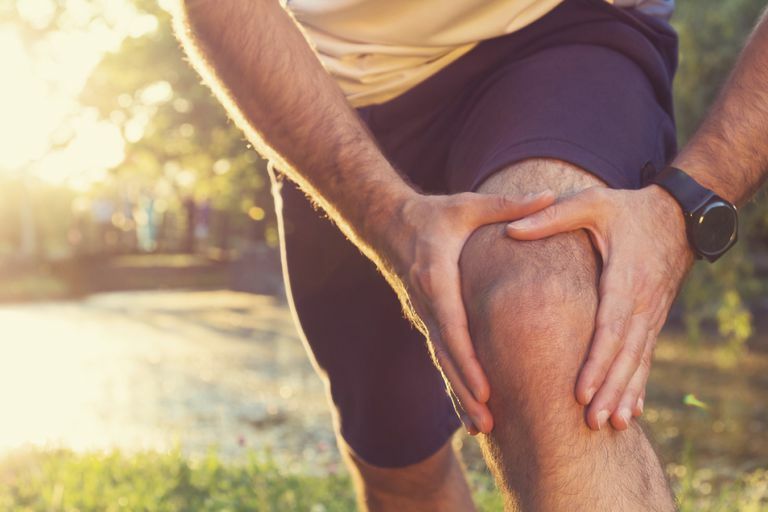 If you were surprised that knee pain can be a symptom of lung cancer, there are many other "uncommon" symptoms that could be a sign as well. Some lung cancers secrete substances (or the body secretes substances in response to the tumor) which result in symptoms known as paraneoplastic syndromes. These conditions range from those affecting the skin, to the kidneys, to other joints, to nerves, and even the eye. In other words, symptoms that affect virtually every body system. In the studies above on knee pain in lung cancer and colon cancer, it was thought that the inflammation represented a paraneoplastic syndrome. Some researchers believe that having an awareness of pareneoplastic symptoms that could be related to lung cancer would lead to an earlier diagnosis of the disease. Paraneoplastic symptoms are not correlated with either the stage or severity of the cancer, and may appear long before a tumor such as lung cancer would cause symptoms such as a cough or shortness of breath. These symptoms usually disappear when a tumor is removed, but if they recur, may represent a recurrence of the cancer or metastases. Hypercalcemia of malignancy: High calcium levels in the blood may cause confusion, nausea and vomiting, abdominal pain, muscle aches, and more. Hyponatremia of malignancy: Low sodium levels can lead to brain swelling and symptoms of nausea and vomiting, headaches, muscle cramps, confusion, and more. In addition, lung cancer is fairly unique in that bone metastases may occur to the small bones of the hands and feet. You may be familiar with common lung cancer symptoms, such as a persistent cough, or coughing up blood, but were you aware that most people are unaware of the most common symptoms of lung cancer today? That's what recent studies have taught us. Unless you fit the criteria for lung cancer screening, having an awareness of symptoms is the only way to catch this disease in the earliest most treatable stages. Yet lung cancer symptoms are changing. Just as with heart disease, the symptoms of lung cancer in women are often different than men. And the symptoms in non-smokers are often different than those in smokers. This is important considering lung cancer in non-smokers in now more common than lung cancer in smokers. The majority of people diagnosed with lung cancer today are either former smokers (they quit in the past) or never smoked. Why are the Symptoms and Signs of Lung Cancer Changing? In the past, lung cancers such as small cell lung cancer and squamous cell carcinoma of the lungs were more common. These cancers tend to grow near the large airways of the lungs. Since they grow near the airways, they often cause symptoms early on, such as obstruction of the airways leading to a cough, wheezing, and coughing up blood. Today, and especially in women, non-smokers, and young adults, lung adenocarcinoma is the most common type of lung cancer. These cancers tend to grow in the outer regions of the lungs. In this location, they can grow quite large without symptoms as they are a long distance from the large airways. The first symptoms of these cancers may be shortness of breath, unintended weight loss, and simply a vague sense of being unwell. Unfortunately many people attribute these early symptoms to being out of shape or getting a few years older, and it's been found that lung cancer in non-smokers is often diagnosed in later stages of the disease. It's simply not high on most doctor's radar screens. Anyone who has lungs can get lung cancer. And not only is lung cancer on the rise in non-smokers, for one group of people the risk of lung cancer is increasing steadily: young, never-smoking women. Take some time to educate yourself about early signs and symptoms of lung cancer. Keep in mind that smoking is not the only cause, and it's important to review your risk factors for lung cancer. For example, exposure to radon in our homes is the second leading cause of lung cancer and the number one cause in non-smokers. Since radon has been found in homes in all 50 states, everyone is potentially at risk, and the only way you can know for sure is by picking up a $10 radon test kit at your hardware store. Hearing that knee pain (and other uncommon symptoms) may be the first sign of lung cancer may seem frightening. Actually, however, researchers are finding these symptoms encouraging in some ways as a possible way of detecting lung cancer earlier when it's most treatable. Perhaps the bottom line should be that any unusual symptoms you have deserve an answer, whether or not they could be a symptom of lung cancer. The spectrum of what to know in medicine is rapidly expanding, at the same time that the length of the average clinic appointment is contracting. Even if you are someone who is ordinarily quiet or shy, learn how to be your own advocate in your medical care. As we're learning in studies showing uncommon symptoms of lung cancer, it could even be a matter of life and death. Cantini, F., Niccoli, L., Nannini, C. et al. Isolated Knee Monoarthritis Heralding Resectable Non-Small-Cell Lung Cancer. A Paraneoplastic Syndrome Not Previously Described. Annals of Rheumatoid Disease. 2007. 66(12):1672-4. Gasagranda, B., Leeman, K., and M. Heller. Knee Pain and Swelling: An Atypical Presentation of Metastatic Colon Cancer to the Patella. Radiology Case Reports. 2014. 9(1):890. Kanaji, N., Watanabe, N., Kita, N. et al. Paraneoplastic syndromes associated with lung cancer. World Journal of Clinical Oncology. 2014. 5(3):197-223. Paraschiv, B., Diaconu, C., Toma, C., and M. Bogdan. Paraneoplastic syndromes: the way to an early diagnosis of lung cancer. Pneumologia. 2015. 64(2):14-9. Efthymiou, C., Spyratos, D., and T. Kontakiotas. Endocrine Paraneoplastic Syndromes in Lung Cancer. Hormones. 2018. 17(3):351-358.